The social online game Roblox appears to have taken issue with popular YouTube Felix Kjellberg, also known as PewDiePie. In a recent video published on Youtube, Kjellberg spoke about receiving a notice from the game’s admins. Apparently the account he was using was deleted for using an offensive username, which was just a variation of PewDiePie with numbers on it. While Kjellberg joked about the ordeal, some of his fans began reporting on getting similar notices for using 'PewDiePie' in their own usernames. Kjellberg has only streamed Roblox a few times, and fans of his flocked to the same server he was playing on to greet him. After his stream however, the account that Kjellberg used to play with was eventually deleted. Some fans speculated that the game’s moderators may have shadow-banned him because of the mature nature of his content online. 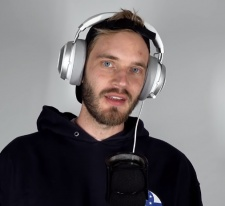 In the past, Kjellberg has received backlash over some of the offensive things he has said in his videos, as well as a few of his streams. Roblox Corporation has not yet clarified why this has happened, nor given a reason to why PewDiePie's name and account are unsuitable. Kjellberg himself has yet to make any other additional comments about it outside of his video.